This beautiful dress will come in handy for lots of imaginative play. The dress is made up of four layers, with a net underskirt, satin, lace and more lace, with the final layer being trimmed with gold jewelled brooches. The flared sleeves are trimmed in gold, as is the bodice. 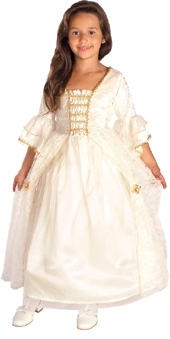 This dress will have any youngster feeling and acting like a princess! Size: Large - fewer than 5 available for next day dispatch.